The Grade One contest staged over two miles and five furlongs has attracted 112 entries, with 37 of those trained in Ireland. The Dermot Weld-trained Rite Of Passage was third in last season’s Grade One Weatherbys Champion Bumper and won a maiden hurdle at Leopardstown in January. Willie Mullins saddled Mikael D’Haguenet (2009) and Fiveforthree (2008) to win the last two runnings and he has engaged Grade Three winners Quel Esprit and Enterprise Park among 13 entries that also include Morning Supreme and the Grade One-placed pair of Fionnegas and Rhyl Accord. Paul Nolan has entered Shinrock Paddy, who defeated Rhyl Accord to win a Navan Grade One on December 13. The Jessica Harrington-trained Coole River defeated Quel Esprit to land a two and half-mile Leopardstown Grade Two hurdle in January, while the John Hanlon-trained Luska Lad won the Grade Two Moscow Flyer Hurdle at Punchestown, a race in which the Noel Meade-trained Grade One paddypowerpoker.com Future Champion Novices’ Hurdle victor Hollo Ladies was fourth, one place behind the Charlie Swan-trained Start Me Up. Loosen My Load won the Grade Two Sharp Novices’ Hurdle at The Open in November for trainer Henry de Bromhead, while Tom Mullins has engaged the unbeaten Dr Whizz. Edward O’Grady saddled Drumlargan (1980) and Mister Donovan (1982) to victory and the Irish handler has entered Acapulco, a classy performer on the Flat when with Aidan O’Brien and winner of a maiden hurdle at Navan on January 27. The Nick Williams-trained Reve De Sivola landed the Grade One Challow Novices’ Hurdle at Newbury in January from the Robin Dickin-trained Restless Harry, who franked the form with a fine victory over General Miller in the Grade Two Neptune Investment Management Novices’ Hurdle at Cheltenham on Festival Trials Day. Nicky Henderson has a powerful hand with 10 entries. Among them, Quantitativeasing is unbeaten in three starts, General Miller won at the course in December, Kerada and Master Of The Hall have won their last two starts and Finian’s Rainbow was third in the Challow Hurdle. Peddlers Cross landed the Grade Two Rossington Main Hurdle at Haydock in January for trainer Donald McCain, while the Howard Johnson-trained The Knoxs has won both his starts at Newcastle and the Karen McLintock-trained Bygones Of Brid saw off Washington Irving at that same venue. The Tom George-trained Tell Massini defeated Reve De Sivola in a Grade Two at The Open and added the Grade Two Albert Bartlett Novices’ Hurdle over three miles back at Cheltenham in December. Paul Nicholls has entered Grade Two Prestbury Juvenile Hurdle victor Pistolet Noir, easy Taunton winner Ghizao and classy French import Najaf among five entries. Alan King has seven entries including Grade Two Winter Novices’ Hurdle winner Manyriverstocross, dual winner Stoney’s Treasure and recent Taunton victor Whistlejacquet. Chartreux easily landed a Fos Los maiden hurdle for trainer David Pipe on January 28, to go with previous wins in a bumper and a point-to-point, while the same trainer’s Sure Josie Sure has won both of her completed starts over hurdles. There is one Australian-trained entry in the shape of Anthony Cosgriff’s Onajet. 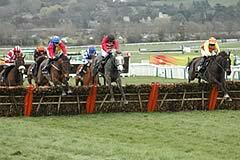 Class 1, Grade 1, Total Prize Fund £100,000, 2.05pm, Cheltenham, Wednesday, March 17, 2010. Two miles and five furlongs. For novice four-year-olds and upwards. Weights: four-year-olds 10st 13lb; five-year-olds and upwards 11st 7lb. Allowances: fillies & mares 7lb. Entries closed Tuesday, February 2, 2009. Entries revealed Thursday, February 4 (112 entries).Scratchings deadline February 23. Six-day confirmation stage March 11. Final declaration stage 10am, Tuesday, March 16. Form figures supplied by Weatherbys and are correct up to and including the racing of Monday, February 1. May not include some overseas form. 2. The Ballymore Properties Novices’ Hurdle, along with the Albert Bartlett Novices’ Hurdle and the RSA Chase, are acknowledged as championship races for the staying novice hurdler and chaser. 3. Only one horse has won both the Ballymore Properties Novices’ Hurdle and the RSA Chase. The West Awake took the hurdle race in 1987 and the chase event a year later. 4. The smallest field for the Ballymore Properties Novices' Hurdle was 14 in 2000, when there were three non-runners. Previously the lowest number of runners was 15 in 1973, the year of Willie Wumpkins, who later dominated the Coral Golden Hurdle Final at The Festival with three straight wins from 1979-81. There were also 15 runners in 2004, 2007 and 2008. The largest field was 29, achieved in 1979, 1984 and 1991. The current safety limit is 24. 6. The Irish have an excellent record in the Ballymore Properties Novices’ Hurdle with 14 wins, including six consecutive victories from 1973-78.